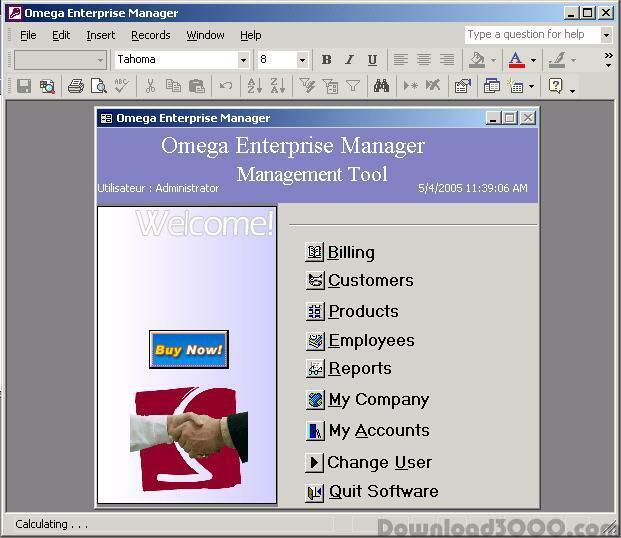 Omega Enterprise Manager is a complete administrative solution for your business. You can manage all aspects of your company from a single comprehensive, highly flexible software application. Omega Enterprise Manager allows you to keep track of suppliers and employees, accounts and customers, your inventory and so much more. And, you won't need to go elsewhere to produce professional-quality, readable, meaningful reports. Sales summaries, profit margins, employee schedules, orders, cost summaries and more. It's all available at the click of a mouse, from one indispensable application: Omega Enterprise Manager. Our administrative solution for billing includes the following features: Billing and accounting reports Inventory. So everything can be accounted for. Customers. To keep track of the good ones and the ones which may become problematic Suppliers. Because you must be able to track down a component at a moment's notice Multi-user capability. A central database keeps track of all users. System Requirements Operating System: Windows 98/ME/NT/2000/XP/2003 Microsoft Office Version: Office XP or Office 2003 If you do not have Office installed on your PC just installs the supports files from our website. These supports files can and will only works with Omega Enterprise Manager.